Pre-school fun, fantasy and education with colourful rotund characters Tinky Winky, Dipsy, Laa-Laa and Po. Browse content similar to Teletubbies. Check below for episodes and series from the same categories and more! Preschool series. The adventures of four colourful creatures called Teletubbies. 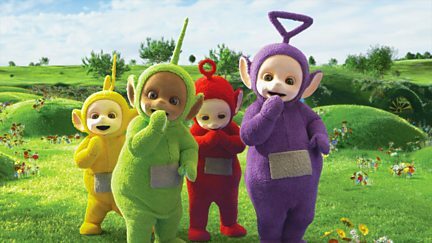 The Teletubbies see some children in South Africa watching monkeys. Dipsy runs all over Teletubbyland. Pre-school comedy combining fun, fantasy and education. Preschool fun and education. The Teletubbies watch some children watering the garden. Po fetches the other Teletubbies to watch some girls perform an Indian dance. The Teletubbies watch a little girl make breakfast for her mother. The Teletubbies play a sitting and standing game. Laa-Laa comes out of the house, does a little dance and calls the others for a big hug. The Teletubbies watch Oliver and his llama. Po is feeling happy, making Dipsy happy too. It's time for Tubby Toast. Po and Tinky Winky are so excited that they fall over. The Teletubbies watch two girls climb a hill and look at the view. Then Po climbs a hill. The Teletubbies are sitting at their table when they hear a funny noise. The Teletubbies run off to watch some children tell a story with their drawings. Some voice trumpets rise and make funny animal noises. A piano appears in Teletubbyland. The Tubbies see two children watching a herd of elephants in a safari park. Laa-Laa comes and joins the others to watch some children squeezing things. The Tubbies watch some children perform a Nativity play. The Teletubbies play games amongst the hills and watch a little girl painting. A voice trumpet rises and sings Po a nursery rhyme. The Teletubbies watch some children playing in the park and take turns on a seesaw. The Teletubbies play a jumping game in Teletubbyland. The Teletubbies watch two girls go ten pin bowling. Laa-Laa plays with her ball. The Teletubbies enjoy a hug, before listening to a lady tell a story about four friends. A voice trumpet makes woofing sounds, which the Teletubbies copy again and again. The Teletubbies watch a little boy show his friend his scrapbook. The Teletubbies sit down for Tubby Toast. After they've eaten, some more toast arrives. The Teletubbies watch a boy whose dad is a firefighter. Laa-Laa sings a fountain song. The Teletubbies watch two children and their goats. A dancing teddy bear appears. A girl goes to the shops to buy a sari. The Noo Noo tidies up the Teletubbies' blankets. The Teletubbies watch a little girl read the story of Jack and the Beanstalk. Laa-Laa is playing indoors with her ball, but the Noo Noo catches it and tidies it up. In order to see what everyone else is doing, Tinky Winky gets on top of the dome. 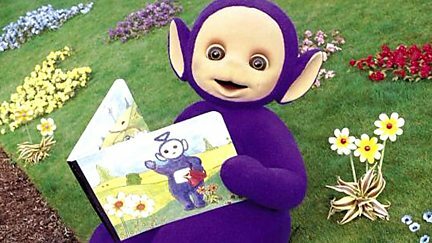 While the Teletubbies are sleeping, Tinky Winky sings a loud song and wakes them up. The Teletubbies walk about in a huddle, before watching a girl with lots of puppies. The Teletubbies watch some children playing an 'on top and underneath' game. The Teletubbies watch some children who have a barrel organ. A man turns the handle. The Teletubbies take their favourite things to bed. Laa-Laa struggles with her ball. The Teletubbies watch some children buy different sorts of vegetables. The Teletubbies watch children have fun riding their trikes. Po is riding her scooter. The wind blows Tinky Winky's skirt, Dipsy's hat, Laa-Laa's ball and Po off her scooter. Dipsy follows a rain cloud and then his hat falls in a puddle. Po sees a bluebell in the grass. Tinky Winky and Dipsy come to look at the bluebells. The Teletubbies watch a group of children playing in the sea. Po falls off the slide and then watches some children stretching words with Stickman. The Teletubbies watch some children tackle an obstacle course. A bouncy cushion then appears in Teletubbyland, and they all take turns to bounce. The Teletubbies see some children who are watching birds in a bird bath. A little boy plays cricket with his dad. The Teletubbies see some girls who live with their mum and dad on a boat. The Teletubbies watch a little boy with his grandad's pigeons. Laa-Laa tells Tinky Winky and Dipsy the story of Po. The Teletubbies watch children riding on a rickshaw. The lion and bear play their hide-and-seek game, and some children watch dragonflies. The Teletubbies perform a skipping dance, and some children dance an African dance. The Teletubbies watch a group of children washing their goat in the river. The Teletubbies watch children making a boat and Tinky Winky's bag falls in a puddle. The Teletubbies watch a Spanish girl play the violin for her friends. They watch Po dance. Po watches a little boy playing crazy golf. The Teletubbies are playing a hiding game. The Teletubbies rush off to see a little Indian boy playing on a drum called a tabla. The Teletubbies watch children hanging out their washing. A clothes line appears. The Teletubbies watch Spanish children picking chillies. There's tubby toast for everyone. Little Bo Peep has lost her sheep and comes to Teletubbyland to find them.